A Wildside Press reissue is now available. Also available on e-book from renowned mystery-book publisher MysteriousPress.com. 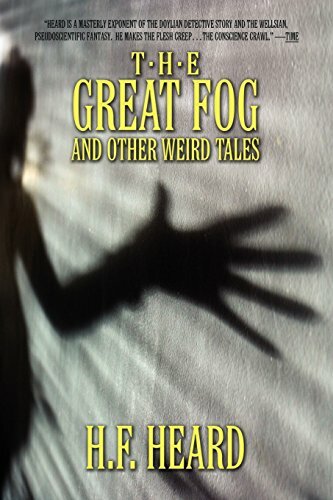 The Great Fog and Other Weird Tales is literary adrenalin for the jaded reader of the macabre. Mr. Heard is a master of capturing the split second when the usual becomes the unusual, when the ordinary becomes the mysterious. His murderers are not killers but astute men of ingenuity, his dreamers are men of unknown countries — and the cats — well, not even these inscrutable creatures are safe from his malevolent pen. Perhaps you were one of those fortunate readers who enjoyed Mr. Heard's gorgeous detective yarn about the mankiller bees a few years ago, A Taste For Honey. If so, and if you have appetite for tales based on a sparkle of science or mysticism, here is a book to give you the ponders. It ranges from sardonic and beautifully ingenious crime detection to the deep subconscious rhythms of religion (or demonology). How did a crayfish floating on its side in an aquarium lead to the truth about Mrs. Smirke falling from the stepladder? What happened to the world when scientists began monkeying with mildew and fungus (as in the case of penicillin)? What was it that restrained the learned spinster schoolteacher, Miss Potts, from committing suicide? Or the antiquarian, investigating an ancient cathedral, who—well, how shall we put it? — got caught in the dance of the earth-music? The title story, 'The Great Fog,' is certainly one of the most remarkable gables suggested by our present affairs. Mr. Heard has brilliantly carried into test tubes the scientific fantasy invented by Poe and developed by H. G. Wells. He ranges botany, meteorology, psychology, all the 'ologies, for his plots; on the dark side of science he finds the golden bough of magic fiction. Nothing is so rare as a collection of really intelligent short stories. It is a form of writing that has long been corrupted by its easy salability... This (to my own special taste) belongs with the best. Heard is a masterly exponent of the Doylian detective story and the Wellsian, pseudoscientific fantasy. He makes the flesh creep… the conscience crawl. Mr. Heard has combined vast and curious learning with a strange and wonderful imagination. The result is a volume that should interest enthusiasts of the macabre and of scientific fantasy. His tales have an overwhelming effect. He is always original in both manner and matter. These are good supernatural stories of science and idea. Mr. Heard's stock of odd knowledge is extraordinary. The writer constitutes a contemporary cross between Edgar Allan Poe and Conan Doyle... Each and every one of Mr. Heard's pieces of grue is as masterfully designed a short story as can be imagined.